So, we’re in a cast and place foundation where the footing had dropped. And when the footings drop that generally means that there needs to be some piering done. And piering is when the footing needs to be stabilized. And as you can see, by how I can stick my hand under this, the footing has dropped. So, lifting the footings not a very good idea cause then the footings floating. So, it can be done, but there’s a whole lot to talk about to make that happen and generally doesn’t even make any sense economically. But what you want to do, is you, the foundation of anything’s most important, so this footing and this wall need to be set still. So, we’re going to put three-quarter piers on the corner of this foundation, on six to seven-foot centers here, you never want to go past eight, it starts to be too far for the span. And we’re gonna put a concrete bell-bottomed pier underneath it. We get these 100-year rains every five years and these 100-year droughts every five years, so when we design a system now, it’s important that you design it to succeed. Things to look for...when mud is on your basement floor. We’re gonna also, if there’s a downspout in the corner, which I think there is, we’ll take it out and away so that we have nothing disturbing the corner of the house from wet to dry, wet, dry, that’s what cause these shifts in our climate change. That’s just from being dry to hot, so severely, we get these hundred year rains like, every five years and these hundred- year droughts every five years, so when we design a system now, its important that you design it to succeed. And I won’t make fun of the franchise that did this, but again, um, the coff link that was put in, which is this, um, it’s supposed to catch the water from the wall crack. Like this crack here. So, we’re assuming we have a break in the footing someplace in this area, and someplace over there, although we don’t have a foundation break that shows it. Our breaks are much further down the footing could be broken just like this isn’t touching, and it’s just not shown up yet. It just hasn’t shown the symptom. So, I would gather that when this drain tile system was put in, this foundation was probably failing already and that’s how you know. Mud should not be sitting on top of the footing like that. 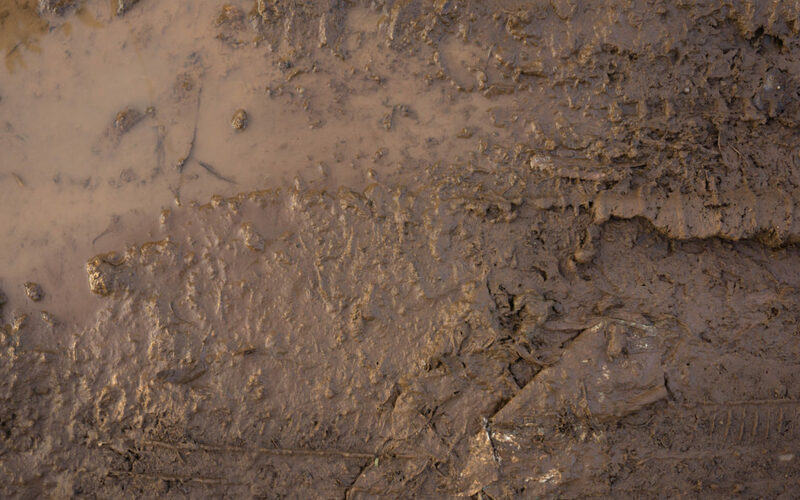 When mud sits on top of the footing, that means that mud, that organic material and now its fighting that whole distance across. So that all has to be cleaned out and then something hard put in there, an epoxy resins gonna have to be put in there to bridge the difference. It’s a lot of work to clean that out but that’s what’s gotta be done. Next off, there’s a drain tile system here, we see the river rock, that’s good but it wasn’t filtered at all. And that’s why the mud, look at this trail running across the floor here, that was the indicator that got the homeowner to call the person that put the drain tile system in to come out and take a look. Well now, they come out and take a look and this happens. So, what is this? Well this is when you break the floor out, you dig the earth out to the bottom of the footing but not exceed the footing and then a geo-textile’s put in the trench kind of like putting nylons on a leg. Just enough to keep the small sand, silts, and small issues from getting into this new river rock which already has the edges knocked off of it. Well, as we look down, there’s our drain tile pipe right there. Now those slits in the pipe, how can they accept any water with all that clay stuck in there. So that’s never gonna work. Most of my work is following behind these types of systems. So, folks make sure that you uh, if their talking about a patented pipe or patented process…I’m not against change at all. Embrace it, make sure it’s gonna be something that’s satisfying and if something is that good, why would just one company have it? If I invented Velcro, I’m selling it to everybody. Til next time. If you have questions about your foundation, don’t let a little bit of water turn into a “lot.” Feel free to contact us with your questions.